Seascape Strawberry is an everbearing strawberry which produces a first crop of fruit in spring and then subsequent crops throughout the summer and into fall. Unlike Junebearers, this everbearer is not sensitive to the length of day. It has five-petaled, white flowers with yellow centers which appear on the plants from early spring to early fall. Flowers give way to red, cone-shaped strawberries. It will grow from 8" to 10" high and 2' to 3' wide. 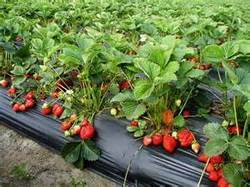 Seascape Strawberry likes to be planted in full sun in rich organic soil. Keep well watered especially when the berries are producing. Wildlife and birds will be attracted to the berries. If you wish to harvest them yourself, cover the plants with bird netting. Seascape Strawberry makes great jam or jelly, and of course, is great for eating fresh. Seascape Strawberry can be planted as a groundcover, or planted in containers, whiskey barrels, or a strawberry pot. Allow the 'babies' to root over the season and remove the mother plant every two years.